A noble creature ever-present in great battles, land crossings, humble work and elite competitions, the horse shares a deep connection with human beings. They are our quiet confidants, filled with a sense for freedom, independence and service. Proud and regal, the horse is equally mystifying as it is enchanting, exuding a unique wisdom unlike any other. Powerful in stature, warm in expression, the horse connects with our hearts on many levels. 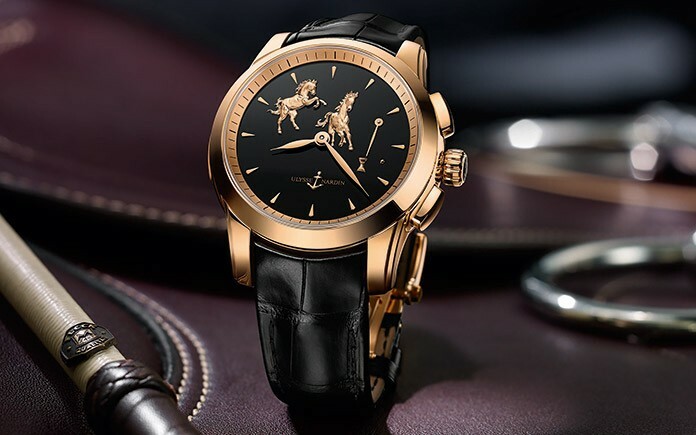 Ulysse Nardin celebrates this extraordinary animal with its Hourstriker Horse. Crafting a collection of 28 pieces in 18ct rose gold or platinum, each edition features hand-carved Jaquemarts on a genuine black onyx dial. One of the rare masters of high horology to use Jaquemarts, Ulysse Nardin is also one of the earliest watchmakers to fuel the rebirth of the striking mechanism. In this sound-motion coupling, Jaquemarts move in synchronicity with each strike of a gong. 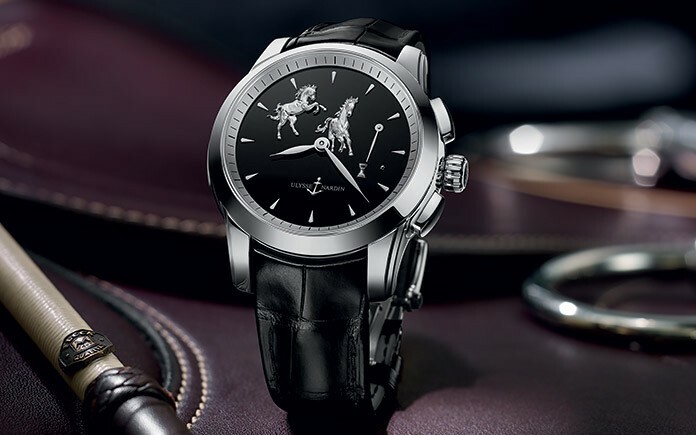 A sonnerie en passant with a rare automatic movement, the Hourstriker Horse plays on hour and half hours on demand or can be set to “gong” the time in passing. Every time the hammer hits the gong, the horse Jaquemarts perform in concert. Postured between ten and 12 o’clock, and one and three o’clock, the horse Jaquemarts portray two stances. In one, the horse is showing fear, “rearing up” to fight or flee. In the other, it is racing with purpose – either toward or away from something. Interpretation is left to the wearer. Both horse figurines radiate stunning beauty, as seen in their deeply chiseled muscles, pronounced facial features, and long and voluminous mane and tail. Set within a 42mm round case, the watch is artistic as it is functional. Ample in size, it is also self-winding, has a power reserve of approximately 42 hours and is water resistant to 30 meters. Its face cover is sapphire crystal, ensuring it is anti-reflective, highly durable and scratch resistant. Its case-back, also constructed of sapphire crystal, protects its complex inner workings while allowing for visibility. A tribute to the valiant horse, the timepiece is another example of music and motion telling time in rhythm within the iconic Hourstriker family.